Twelve lignan derivatives were synthesized from deoxypodophyllotoxin isolated from Hernandia nymphaeifolia. Cytotoxicity evaluation against cholangiocarcinoma, KKU-100, and HepG2 cell lines showed that compounds 3, 9, 10, and 13 exhibited stronger cytotoxicity than the starting material, 1, with IC50 ranging from 0.42 to 2.01 μM. Compound 10 displayed interesting activity by showing IC50 values of 0.75 and 0.46 μM against KKU-100 and HepG2 cell lines, respectively. 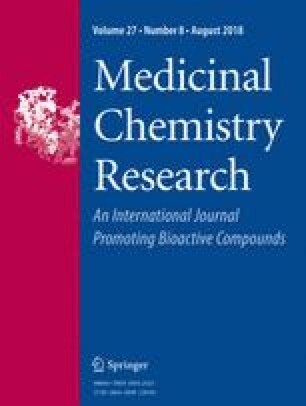 From these observation, 10 seems to be useful as a lead compound for the development of anticancer agents. The online version of this article ( https://doi.org/10.1007/s00044-018-2214-9) contains supplementary material, which is available to authorized users. The Post-Doctoral Training Program from Research Affairs and Graduate School, Khon Kaen University for Jittra Suthiwong is acknowledged (Grant no. 590012). This work was supported by the Thailand Research Fund (RSA5980022), Khon Kaen University and The Center of Excellence for Innovation in Chemistry (PERCH-CIC), Office of the Higher Education Commission, Ministry of Education.